Home » Tea & Coffee Makers » Tea Brewers & Kettles » What’s The Quietest Electric Kettle on the Market? There are times when having a quiet kitchen appliance doing its work is of utmost importance. You may want a cup of tea when your baby is finally asleep but you’re too afraid to put on your noisy kettle lest the whistle should wake her up. Maybe it’s time to have one at work but the office kettle disturbs your colleagues sitting close to the pantry. Whether it’s the whistle at the end or the gurgling of water while it’s boiling, these annoyances should not prevent you from having a hot drink whenever you want. There are kettles that are quieter than others, but what’s the quietest electric kettle on the market? When looking for the quietest kettle, we also look at other important features, like how fast it is at boiling water, auto shut off, its capacity, whether it pours easily without dripping, whether you can select desired temperature, and how easy it is to clean. Some models do make a little bit of noise right at the end because the heat agitates the water, but that’s negligible. Our quiet electric kettle reviews should help you narrow down your choices quite a bit. There’s one pick that offers variable temperature control and the rest just shut off when the water reaches boiling point. The former are good for coffee and drinkers who like to make pour over coffee or use manual drip coffee makers, or use a variety of teas that are best steeped at specific temperatures. If you’re not too bothered about noise level but are more concerned about getting good variable temperature control, then take a look at our variable temperature electric kettle reviews. The Molla Puro Cordless Electric Water Kettle brings subtle fashion to quick productivity. Measuring 9 in. x 9 in. x 12.2 in. with 1.5 litre capacity, this model combines a sleek design with an increased water capacity. It is comprised of German made glass, giving the viewer a glimpse into the boiling process and any build up of scaling so that it can be cleaned in a timely manner. Other components at work include the BPA free outer shell. This makes the kettle safe-to-the-touch and ensures safe drinking water. This model contains an anti-calcium filtration system that blocks hard water scales from exiting the kettle and into your cup. The soft-top lid creates a vacuum-tight seal, ensuring a speedy boiling process. Furthering the safety measures, the auto shutoff activates when the water level goes below .25 litres to prevent boil dry damage to the kettle, and when the water reaches a full boil. The LED activation switch lets you know when the kettle is on and when boiling is over. There is no annoying beeping or whistling sound. The base is heavy so there is no vibration noise. Just the faint sound of the water boiling is heard for a few seconds before auto-shutoff. The sound would be equivalent to a small humidifier, making this model optimal for a quiet space. 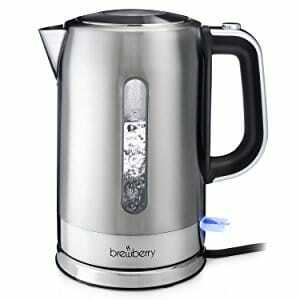 With a power rating of 1500 watts, the boil time comes in at a speedy 5 minutes when the kettle is filled to capacity. This quiet electric tea kettle is cordless, meaning the base is plugged into a power outlet and that heats the kettle. When the water is ready to be poured, the kettle can be lifted from the base and carried around to pour. There are some slight limitations with the pourability, due to the filter being placed within the spout. This filtration system can be removed if your water quality is good. A couple of users have said that the button on the lid that pops the lid open failed to work after a years so you have to manually lift the lid then. The design and detail used to produce the Brewberry Cordless Kettle model is second to none terms of being easy to clean. This kettle uses stainless steel construction with BPA-free plastic elements. Coming in at 1.7L of capacity, this kettle is a good size for a family. Sizing measurements come in at 5.5 in. x 6 in. x 9 in., combining a small footprint with height. This design works to create a more thorough boil that works to reduce sediments or other such unwanted elements being left in your water. A low water protection feature is present. It will automatically shut off to prevent overheating or internal heating element damage. A blue lit LED switch is added to indicate the completion of the boil. Once it goes off, your water has been boiled to the correct temperature. A filtration screen at the spout entry prevents unwanted scales from exiting the kettle. This device features a charging base which claims to heat and boil your water within 3 minutes for 0.5L and under 6 minutes if filled to capacity. Its power rating is 1500 watts. Because the kettle itself is cordless, simply remove it from the charger and enjoy the easy-pour handle. This kettle is one of the quietest models on the market. No annoying beeping sounds and no whistling. Even the boiling sound is very low and quick. The VonShef 1500W 1.7L model is another durable cordless model. The outer shell is comprised of brushed stainless steel and the flip top lid opens at the press of a button right on the top of the handle. The handle comes equipped with small grooves for hand grips. The bottom base is made with 360-degree swivel technology, making it optimal for both left handed and right handed individuals. Measuring 7 in. x 9 in. x 9 in., this model is perfect for those looking to take up the least amount of real estate. The lower price point makes it a contender for those looking for value. Keeping functionality in mind, VonShef added a few special features to ensure both safety and quick boiling. It is equipped with automatic and manual shut off. A water level window on the side is illuminated with a blue light and this will go off when boiling is reached. This happens between 3 and 6 minutes, depending on the amount of water that is filled. A removable limescale filter at the spout prevents scales from pouring out with the water. It is easy to wash separately. The inside of the kettle is also easy to clean. For a few customers, the flip top lid has been known to pop open when the water reaches a boil, which is something that is generally attributed to kettle over-filling. You should also control the pour flow so as to not allow water to leak around the spout. However, it is a low noise kettle, and once the water is hot it stays hot for quite a long time. This model is by far the best bang for your buck when it comes to productivity, sleek design, and quiet performance. A slightly lower capacity is met with low cost with the Ovente KG83 Series 1.5L Glass Electric Kettle. This 1100 watt borosilicate glass cordless kettle produces a very low bubbling sound when the water boils and a soft click when the auto shut off switch goes off. The stainless steel bottom that hides the heating element ensures a fast boil. The dimensions of this model are 8 x 6 x 9.3 inches. By distributing the bulk of the weight to the bottom, this kettle can boil water at a more efficient level even though the body is made of glass. It would take 5-6 minutes for a full kettle. The auto shut off works when the water reaches a full boil and also when there’s no water detected in the carafe. When it is heating, there are blue LED lights that turn on so that the whole unit glows and can be seen from the corner of your eye. There’s a limescale mesh filter that attaches to the lid and blocks scales from entering the spout. The updated version of this quiet electric kettle has most of its problems solved, but be aware that it is not recommended that you refill it and put it on again immediately after the first time you boil water. This can cause it to stop working after a few months. Reaching the top-tier of electric kettles is Kenwood’s Persona Collection model. This model holds 1.7L of water and measures 6.3 in. x 5.1 in. x 9.4 in., which is quite compact. A safety grip handle is added to ensure it is always safe to touch and carry. The brushed stainless-steel exterior with hidden cord storage underneath adds to the minimalist appeal. The lid opens by just a press of a button on it. To close just push it down and it will click shut. There’s a mesh filter for lime scale blocking. The calibrated water level window provides easy viewing of the inside. This model features technology that is far ahead of the models above and just may be the quietest kettle on the market. This model boasts a “Quiet Mark” certification, which means that you can barely hear any sound from it. If you don’t want the beep alert to sound when the water is ready, you can turn that off too. The LCD display with 7 preset temperature control buttons allows the user to set a specific temperature for various types of teas and coffees and use the Keep Warm function to ensure the water is kept at the desired temperature for up to 30 minutes after the boil. Choose between Celsius and Fahrenheit readings. The standard auto shut off and boil dry protection round up the safety features. When it comes to Kenwood, you pay for what you get. While this model may cost 2-3 times the normal electric kettle, the extra features and durability will make up for this. It’s not possible to purchase any electric kettle base separately. Just curious, but what was the kettle doing on a stovetop?